An adviser to Fraser Anning has quit after the Queensland senator used the Nazi phrase "final solution" in a controversial speech on Muslim immigration. 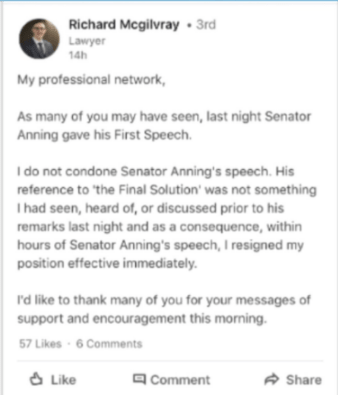 Richard McGilvray resigned just hours after Senator Anning delivered his first speech on Tuesday night. Mr McGilvray, who managed the senator's legislative agenda and negotiations with stakeholders, said he could not condone the views expressed in the speech. "His reference to 'The Final Solution' was not something I had seen, heard of, or discussed prior to his remarks last night," Mr McGilvray posted to LinkedIn. "As a consequence, within hours of Senator Anning's speech, I resigned my position effective immediately." In a post which has attracted 73 likes and seven comments, Mr McGilvray thanked people for their messages of support and encouragement. Despite copping widespread criticism from all sides of politics as well as religious and migrant groups, Senator Anning has refused apologise and does not regret anything he said in the speech. He is committed to a plebiscite on "European immigration" despite ferocious criticism of his praise for the White Australia policy. Senator Anning's party leader Bob Katter backed him "1000 per cent" after his controversial speech, which was littered with false and deeply offensive remarks about Muslim Australians. Mr Turnbull said people who demonise Muslims because of the crimes of a tiny minority will only help terrorists. "The days of the White Australia policy are long, long ago." Senator Anning wants a plebiscite to determine "who" is allowed to move to Australia. "We need a plebiscite to allow the Australian people to decide whether they want wholesale non-English speaking immigrants from the Third World," he said in his speech. Around 1942, the Nazi leadership established a plan called The Final Solution to the Jewish Question, which led to the genocide of more than six million Jews in occupied Europe.